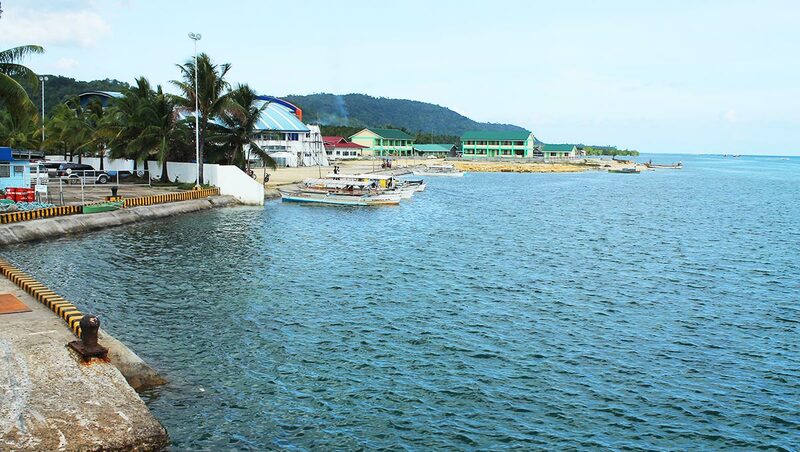 Dapa is the main entry point for visitors to Siargao Island using ferry services to and from Surigao City. Dapa is also the main center for trade and commerce on the island by virtue of the port facilities, which include both vehicle and passenger ferry services, and it being the only location with national bank branches and ATMs . . . although the ATMs are not always working. The town of Dapa is located on the southern tip of Siargao Island and features shallow, coral-filled waters lined with mangrove covered islands, with forested hills behind. The municipality of Dapa also includes two portions of the Bucas Grande island group that lies to the South of Siargao Island. The rapid development of Siargao Island as a tourist destination during the 21st century has encouraged Dapa town to expand, much of the expansion has, sadly, been at the expense of the forests and mangroves. Ironic perhaps, because Dapa gets its name from the vernacular - the act of hiding, prone among the trees and mangroves, to evade the Moro raiders from West Mindanao; the Moro raiders would steal what they could, murder those who resisted and aim to take youthful islanders as slaves. Dapa is a very good place to explore street-side eateries serving up Filipino delicacies, including a varied selection of seafood at sensible prices. It is also the best place to start your adventure by pump-boat to East Bucas Grande and on to the adjacent municipality of Socorro - encompassing Bucas Grande Island and its many natural wonders. Drive to Dapa for the ATM, the extensive market and for a ferry ride to Bucas Grande and Socorro.